Pine Mountain is an enormous isolated landform covered by a vast mesophytic forest, one of the most diverse temperate zone forests in the world. Forming the first of the Appalachian ridges – the oldest mountains on earth – Pine Mountain spans nearly 125 miles from Breaks Interstate Park to Jellico, Tennessee, and it is home to hemlock, oak and pine, tangled rhododendron thickets, mountaintop bogs, mountain streams, caves, massive boulders and jagged sandstone cliffs. The mountain stands among some of the world’s richest coal deposits, but is itself nearly devoid of coal. Its steep slopes and cavernous ravines have made logging nearly impossible, leaving much of the mountain covered with trees that are up to 400 years old. Dense in diversity, Pine Mountain is home to about 100 known rare plants and animals, some of which are found nowhere else in the world. A wide variety of trees, wildflowers, ferns, mosses, lichens – and animals – are native to the mountain. Black bear, elk, deer, flying squirrels, owls and hawks, foxes, mountain lions, wildcats, wolves and coyotes all call the mountain home, as do a variety of snakes, raptors, turtles, frogs, toads, lizards and salamanders. Pine Mountain is a mosaic of two national forests, three state forests, three state parks, an interstate park, two wildlife management areas, a university managed research forest, two nature preserves, three wilderness areas, a scenic highway, a state trail, a national recreation area and an environmental education center. Pine Mountain is a federally designated wilderness area, and along the course of its 12 5 miles it is crossed by only six roads, making it a true ecological treasure. The course is a modified out and back on the Pine Mountain Scenic Trail. Runners go 31 miles to the Marathon aid station (gas station, not the distance) at which point the 100k runners turn around. The 100 mile runners will then do a 10 mile section of trail further out to the Adena Spring aid station, turn around, and then return to Marathon. We’ll then head back to Adena Spring one more time before turning around and heading back to the start/finish in Elkhorn City, Kentucky. The course is mostly single track with a gross elevation gain of 25,893. A Goal – finish. I have absolutely no time goals beyond staying ahead of the cutoffs. I’m hoping this will be easier than my last race considering I have 40 hours to complete the run. I’m not holding my breath though as there is about 25% more climbing than Eastern States, which just about did me in. My best guess is about a 36 hour finish or about an hour slower than ES100. The weather should be about 20 degrees cooler (high of 71, low of 54), the race is 2 miles shorter, and outside of the first climb, the rest of the hills are under 500 feet. 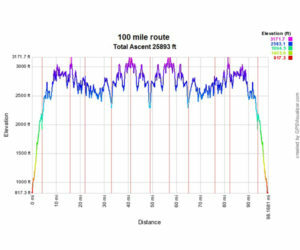 Total elevation gain though will eventually catch up to me, which is why I think this race will take me longer to complete. B Goal – 10 more pictures for the blog. I think this worked well for me last time so I’ll try and snap some more photos so you can better appreciate what these courses look like. Goodness knows I don’t do them justice with my handicapped prose. C Goal – pick up 10 pieces of trash. I’m doubling this goal from my last race. It’s amazing and very sad how much trash ends up on the trails during these races. I’m sure I unknowingly contribute my fair share so this is a way for me to offset my impact on these gorgeous courses. This will be my first race with trekking poles. I’m curious to see if they help save my legs for later in the race. I’m also curious to see if I have enough arm strength to use them for the entire run. I don’t have very good choices for shoes to use in the race. I ended up with hot spots and blisters during my last race using my Fila and Patagonia so am reluctant to use them during this run. Unfortunately, that means I’m left with my Salomon’s, which already have over 900 miles on them. I’ll bring my Fila and Helly Hanson trail shoes (not a lot of cushion with the latter) in case I have any issues, however I’m not confident either will be good for more than 20-30 miles. Between the extra long race and the 9 hour drive home, it probably won’t be until late next week that my race report is done. Be patient.